The air in your home may be 100 times more polluted that the air outside your home! Surprised? The EPA has listed indoor air among the top 5 environmental risks to your health. Your indoor air could contain pollutants like pollen, dust, pet hair, dander, dust mites, mold spores, bacteria and viruses. Could this be the reason for your seasonal allergy conditions? Contact us and we will show you how we can help eliminate these dangers. 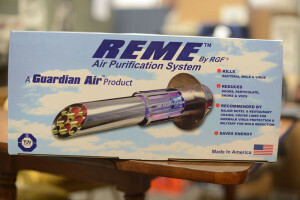 One of our specialties is making sure that the air you breathe is clean. We offer a variety of air filtration products including a whole house UV air purifiers from UV-AIRE, Honeywell’s line of air purification products and the Guardian and REME Air Filter from RGF Environmental. Tune In to Hear Huether?